Amelia's 4th birthday may be 4 months away but with money being tight this year as I'm wanting to save for a car, a holiday and a deposit for a house I'm planning on buying her presents over the next couple of months. I have been looking at getting her more "grown up" presents which will last her for a good few years compared to things she will grow out of by the following year. I'm thinking of getting her a dressing table and chair set as her main present. She loves sitting down and doing her dolls hair and always asked to do makeup too so I think she'll really like this. Along side that I have been looking at the Retro dolls bed for some time now but it's always out of stock when I go to buy it! She loves roll playing with her dolls and I know she will love this. Amelia loves playing with one of my old cameras and is always obsessed with taking photos on my iPhone and iPad so I would like to buy her own. I have seen this white instant camera which I really do like and have also seen this Vtec KidiZoom one which looks good too. I have also been looking at buying Amelia some proline skates as she loves her scooter and roller-skates and I think she would love them! They will be perfect over the summer so we can outdoors more and use them. 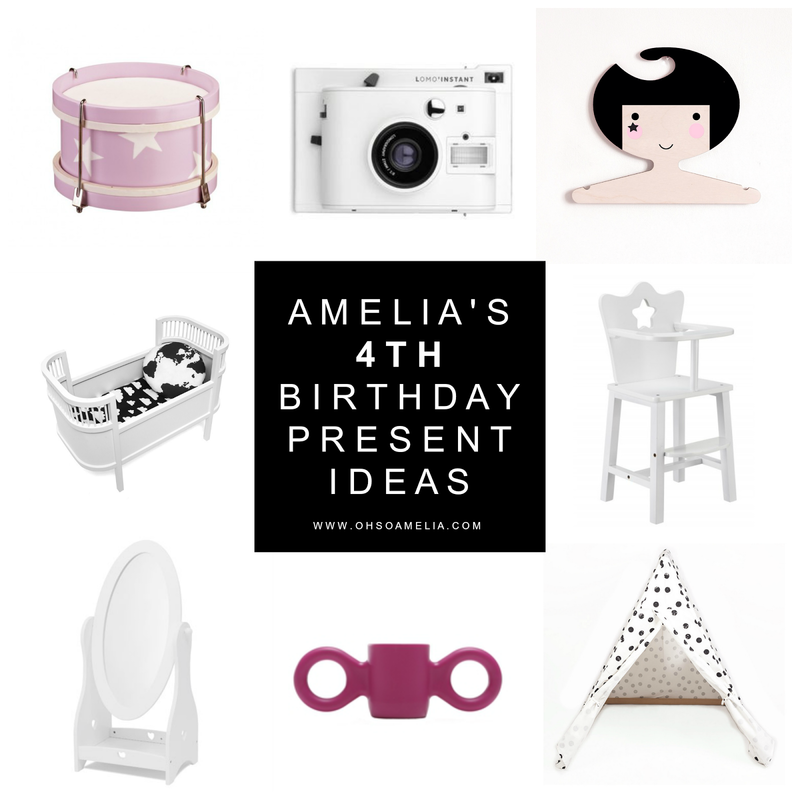 I recently bought a black drum for Harrys birthday so thought it would be nice if Amelia had a matching one in pink so they can play together. 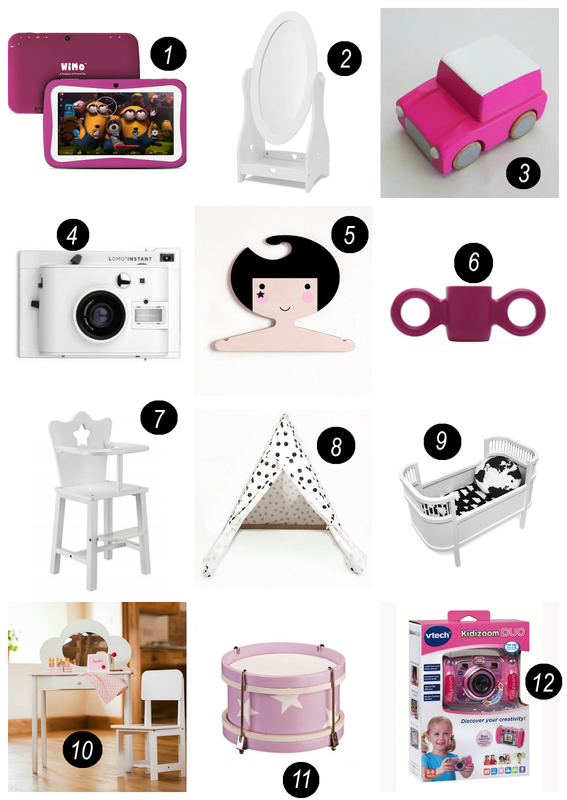 Below are some other ideas which I have for her birthday presents, there are a few which will definitely be bought and then everything else can be ideas for Christmas instead. Do you have any gift ideas for a four year old? Great ideas! Ben's birthday is in April, I've been thinking about getting him a bike as he will be 3, and will be a great time for him to start learning to ride one. Or maybe a Leapad, as they'll both last a few years. As Ben got a lot of things for Christmas I'm still trying to find space for them all! Am also getting them out gradually! I especially like the idea for a camera, will have to take that into consideration for the future.